There are moments in our lives where we feel utterly and entirely lost. There are no clear directions or paths for us to take, just one big ball of confusion without an instruction manual or a tutorial as to how to "live." This is more than okay, for we all become lost in life every now and then. Sometimes it's better to surrender yourself to the universe and let the world show you your next adventure. 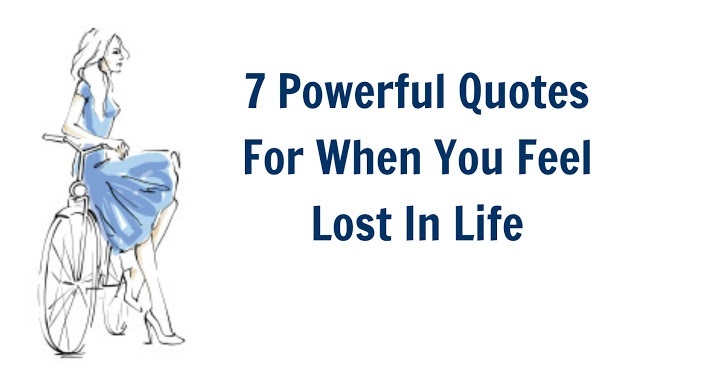 The next time you feel like you're completely lost, remembering these quotes could save you a lot of trouble and time the next time it happens to you! 1. "You can't start the next chapter of your life if you keep re-reading the last one." If you are constantly looking back on the past, then you can never truly live in the present. You must keep moving forward in your life no matter how lost you feel. Now's the time for you to go out there and discover new and amazing things you could be enjoying! 2. "Sometimes you need to talk to a three-year-old just so you can understand life again." 3. "Sometimes you need to step outside, get some air, and remind yourself of who you are and where you want to be." 4. "If it doesn't open, it's not your door." If your calling isn't exactly calling back to you, this isn't necessarily a bad thing. Perhaps it was something that you really wanted to try but didn't work out. That's alright, there are bound to be other doors that you can open, that are made to be opened specifically by you. Never stop finding new opportunities to test yourself! 5. "If you don't like where you are, move. You are not a tree." 6. "Sometimes the bad things that happen in our lives put us directly on the path to the best things that will ever happen to us." 7. "Always remember that your present situation is not your final destination. The best is yet to come." Remember that not everything is permanent. Being temporary can actually be a very beautiful thing. There is always another path that can lead you to something much better or something that you've never experienced before. Be open to the limitless possibilities of the world around you! It's okay to feel lost, just remember that you have more than one path that lies ahead of you! The world will always give you the chance to try something new!